Blank Boi, with some of the materials coming with it (showing the different material zones) and one of the signs that are included in the download. 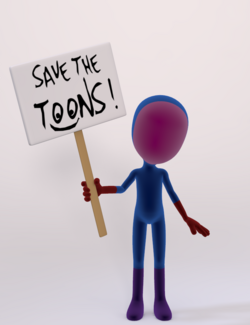 Blank Boi is a toon-style figure, created by The3dZone. It is not free; one can buy a copy of the mesh from DAZ3D. Glasses for Blank Boi or other toon characters. Black and blue rims, clear lens and sunglasses, and also glasses separate from ear pieces for sizing for other characters. Scale according to need. Glass lens settings in Poser Material Room 75% transparency for clear and 50% for sunglasses. A set of eyes with morphs to move the pupils about and make minor positional adjustments. These eyes are intended to be used with the commercial model Blank Boi, available from Daz. They're sized for him, and they load at the right height for his face, but if you want to use them for something else, I won't tell. Simple toon eyes for Blank Boi or other characters, both assembled and separate for scaling or animation purposes.